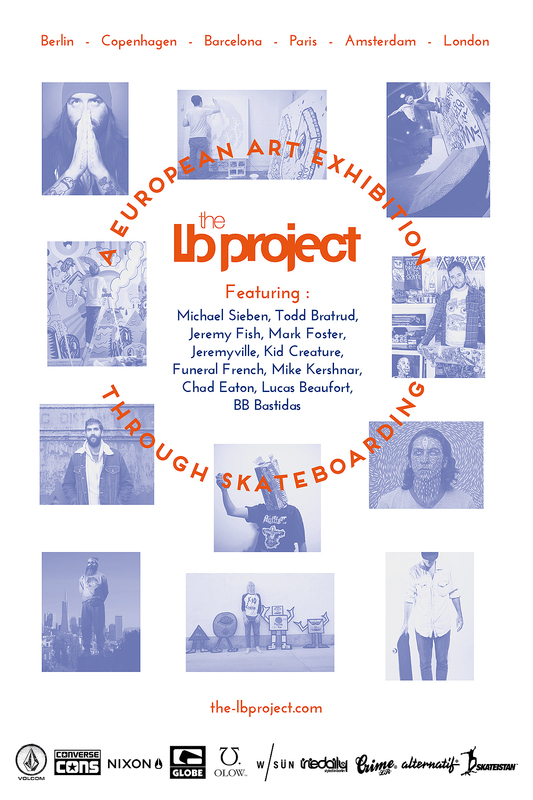 The LB project has been created to Unite the European Skateboard scene through art shows in Berlin, Copenhagen, Barcelona, Paris, Amsterdam and London. A year (June 2014 / June 2015) where artists, skateshops, media and brands will unite to make skateboard and art accessible to all. Through this project we will support Skateistan (http://www.skateistan.org) by donating half of the artworks presented during the exhibition (27 unique artworks). The other half will be given to all the users (http://the-lbproject.com/suscribe/). Indeed, people have the opportunity to register freely on the website to get a chance to win 27 from the 54 unique skateboards. Michael Sieben, Jeremyville, Todd Bratrud, Jeremy Fish, Funeral French, Kid Creature, Chad Eaton, Mark Foster, Mike Kershnar, BB Bastidas, Lucas Beaufort.